Offering quality recording in a lightweight and compact design, the DR-05 Portable Handheld Digital Audio Recorder from Tascam is one that is simple for everyone to use. Ideal for musicians, journalists, teachers, and just about anyone, the DR-05 records WAV or MP3 files at rates up to 24-bit/96 kHz to microSD or MicroSDHC cards for reliable, skip-free storage. It also boasts integrated microphones that capture stereo audio clearly. Connect external mics and sound sources easily and efficiently with the help of a 3.5mm stereo mic/line input. Additionally, the jack provides plug-inn power for mics that require it. 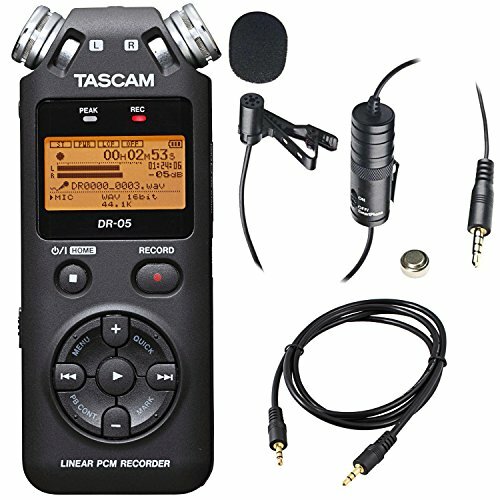 Efficiency, practicality, and great performance combine in the Tascam DR-05 to help you reach the quality recording you are seeking.